WASHINGTON (May 22, 2013) -- The government of Japan has bestowed one of that nation's highest honors on a Japanese-American, a former U.S. Soldier and World War II veteran, for his work furthering relationships between the Japanese and Americans. 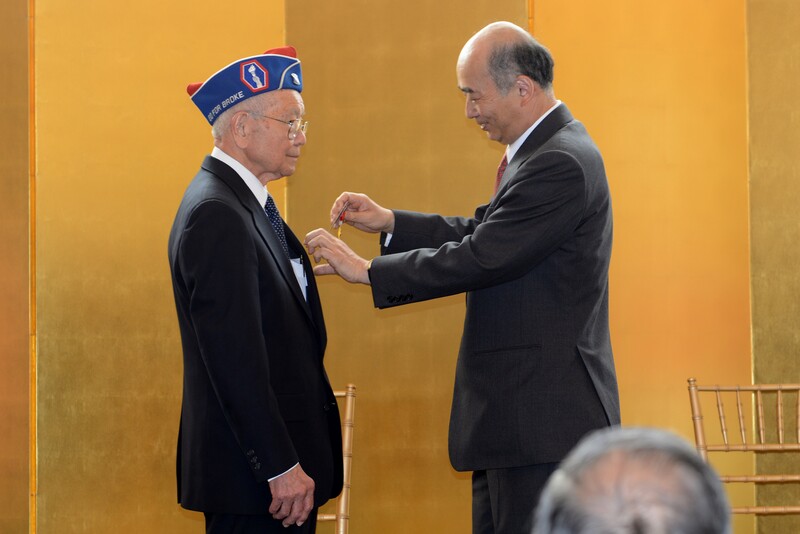 During a ceremony, May 21, 2013, at the home of Kenichiro Sasae, the Japanese ambassador to the United States, Terry Shima was awarded the "Order of the Rising Sun, Gold Rays with Rosette" award. The award comes from both the prime minister and emperor of Japan. Kenichiro Sasae, the Japanese ambassador to the United States, presented the "Order of the Rising Sun, Gold Rays with Rosette," May 21, 2013, to Terry Shima. Shima is a "Nisei," or second-generation Japanese-American. During World War II, he joined the 442nd Infantry Regiment in 1945 in Italy, where he was assigned to public relations. When the unit returned in July 1946, he continued to handle public relations for the veterans association in New York, in Washington, D.C., and in Honolulu. Following two years in the Army, he worked for the Foreign Service for 30 years. Shima also served as the executive director of the Japanese-American Veterans Association, or JAVA, in 2004. He'd only been with the organization for three years. His work there furthered recognition of the contributions of Japanese-Americans in the U.S., helped strengthen relationships between Japanese-Americans and the people of Japan, and also ensured that Japanese-Americans remember how they were interred during World War II. Shima continues that work today, still with JAVA, where he serves as the chairman of its committee on outreach and education. In the citation for the award, it is noted that Shima is "a citizen of the United States." Sasae drew attention to that phrase, saying it carried special significance. "That phrase in the decoration, 'citizen of the United States of America' has special meaning to Shima-san and his generation. Citizens of the United States, this was the identity for those who lived each day loyal to these words, until his very loyalty was tested," Sasae said. 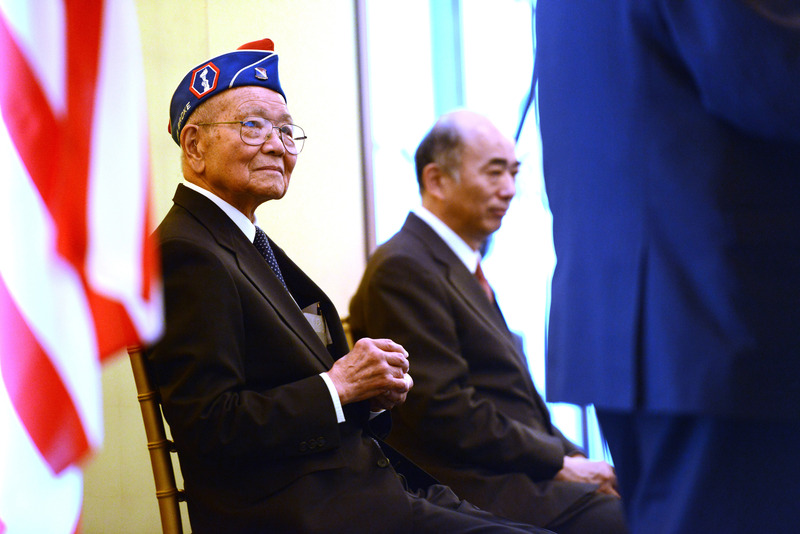 Terry Shima, a second-generation Japanese-American, and World War II veteran, listens to speakers during a ceremony, May 21, 2013, at the home of the Japanese ambassador to the United States. During the ceremony, Shima received the "Order of the Rising Sun, Gold Rays with Rosette" award from the Japanese government. The ambassador said it was a test of loyalty that, during that time, many Japanese-Americans had been imprisoned as a result of the outbreak of war with Japan. Yet many "went directly from being imprisoned in an internment camp to fighting for their country that had imprisoned them," Sasae said. "Fathers told sons to make them proud once again, and they did," Sasae said. "Eight hundred Nisei gave what the very best and most loyal citizens could give, their very lives. They died for those who were coming in the future, the children and the grandchildren." He said that it is Shima who helps ensure those descendants remember what happened to their families during World War II. "Shima-san, you have done your work well," the ambassador said. 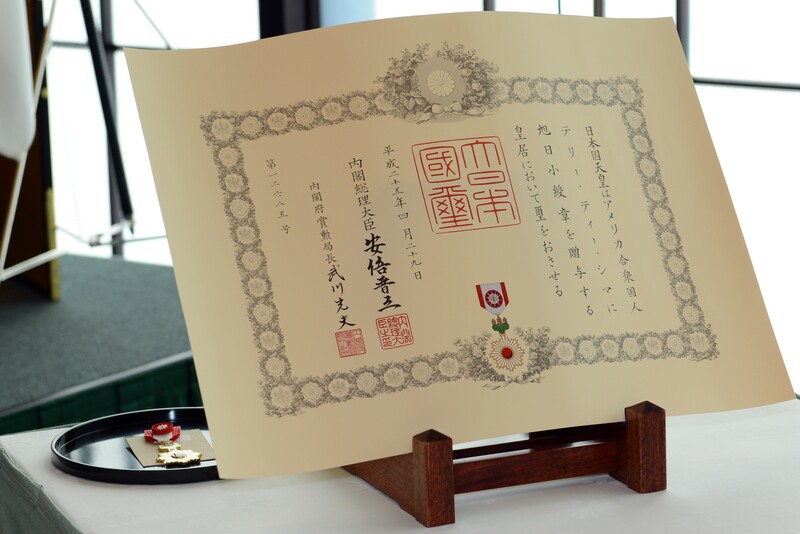 The "Order of the Rising Sun, Gold Rays with Rosette" was presented, May 21, 2013, to Terry Shima, by the government of Japan. Shima is a "Nisei," or second-generation Japanese-American. During World War II, he joined the 442nd Infantry Regiment in 1945 in Italy, where he was assigned to public relations. When the unit returned in July 1946, he continued to handle public relations for the veterans association in New York, in Washington, D.C., and in Honolulu. Following two years in the Army, he worked for the Foreign Service for 30 years. After accepting the award, which included both a medal and a large certificate printed in Japanese, Shima addressed the audience which included many Japanese-Americans, including Japanese-American service members. "I am deeply humbled to be selected to receive the Order of the Rising Sun, Gold Rays with Rosette," Shima said. "I will accept it on behalf of the other volunteers and some 30,000 Japanese-Americans who served during World War II, and the 800 who were left behind on the battlefields of France and Italy and the Pacific." He told those at the ambassador's residence that it is his work now, "in the trenches," to ensure that Japanese-Americans know about their history during World War II within the U.S., and to also further relations with Japan. "Japanese-Americans are proud of their racial and cultural heritage, as we are proud to be Americans," he said. "When Americans questioned Japanese-American loyalty, Nisei volunteered to serve in combat to prove their loyalty. And President Truman affirmed it, on July 15, 1946, at the Ellipse. The president's affirmation resonated across the land." Shima finished by thanking those involved, including the Japanese, for recognizing his contributions to relations between the two countries. "Thank you again Mr. Ambassador for this high recognition, and congratulations to the post-World War II Japanese-Americans, who have competed with the best of the best to contribute to America's greatness, and also, God bless America for the U.S./Japan alliance," Shima said.